Most of this twelve track album is produced by Dan Hartman, whose own pop history gave us hits such as Instant Replay and Relight My Fire etc. In theory, we should be in for a treat. So, let’s get stuck into the first track, Steamy Windows, a song that opens with a bass drum and chugging guitar beat. Tina’s voice here is hard, confident, and perfectly suited to this pop-rock sound, which she delivers an effortless growl. There’s a scattering of harmonica in places too, alongside some little guitar riffs that just lighten it in places. This gave Tina a #13 UK hit when it became the third single in 1990. Then it’s THAT song…. a song that’s synonymous with the name Tina Turner, and undoubtedly one of her widest known songs, the aptly named The Best. The song builds up perfectly, and I love the teasing of the end of the first verse – where it for a moment runs up to the chorus, and then decides to hit verse two. When the chorus comes along, Tina makes light work of this song. This is quite a simple song, and probably helped it to become so widely popular. Some breathy synths fill the gaps in the verses, as a hard pop rock beat stomps on. Gary Barnacle gets the first of his many 80s Obligatory Saxophone solos in this album. It’s an absolutely flawless 5min 30s version. The song gave her a #5 UK hit and was the album’s lead single. Electric piano and guitar open next song You Know Who (Is Doing You Know What). Tina’s vocals really shine here, whilst pitched against electric guitar and a bass. The song really does feel like an unashamed piece of 80s pop style to it, although the chorus is quite catchy after a while. We’re into some sultry bluesy territory now, in Undercover Agent For The Blues, although the soundscapes from what is credited as ‘mystery organ’ feel a bit dated. That aside, this is quite a slow, moody track, and Tina gets to sing in a lower register, and occasionally gets to show off her vocal range. The mood lifts for Look Me In The Heart, which is a much more up-beat and brighter. This is a pretty standard little pop song, but lacks anything more than another saxophone solo and some breathy synths as interest points. Tina feels a bit wasted on this song. It was the album’s fifth single, but it rightly stalled at #31. This is followed by sixth and final single Be Tender With Me Baby, which gives Tina a bit of a rock ballad to play with. She gets plenty of time and space to show off her vocals, which she really does – from a softer vocal near the start, to winning the battle with the soaring strings and electric guitar. She also manages to give a heartfelt ending too. Next up is You Can’t Stop Me Loving You, which is quite a nice little rocky, bouncy number, and really should have made it as a single (replacing Look Me In The Heart?). The chorus has a great melody to it, and Tina also gets a talking section amongst the roaring guitars. This is a catchy toe-tapper. Ask Me How I Feel follows this and this song begins off quite rock-styled before switching back and forth from a quiet segment. A guitar in the background suggests raindrops throughout, apart from about 3min 10s, where it’s just Tina and an light electric guitar strumming away. She breaks out some more big vocals ‘I’m waiting in a storm‘, and the rock returns for the final push of the track. …and along a similar theme, Falling Like Rain follows her wait for a storm. This is quite a nice pop song, complete with some great backing vocals and electric piano sections. It reminds me a little of some of the album tracks found on her 1996 album Wildest Dreams. Next up is I Don’t Wanna Lose You, another one of Tina’s big solo hits. Gary returns for another blast of saxophone here, and it feels well placed in this mid-tempo pop song. This was the album’s second single, and gave Tina a #8 UK hit single, even if it’s such a contrast to the preceding lead single (The Best). Great little track. Penultimate track Not Enough Romance follows this, laden with electronic beats, moog bass, and synths. The end result is a light and bouncy pop song, that’s up-beat and fresh. Tina has an easy time on the vocals, rarely having to break a sweat throughout. The album closes with title track Foreign Affair, which features former-Dire Straits frontman, and legendary guitarist Mark Knopfler expertly wielding his guitar (he had already co-written her earlier hit Private Dancer). Again, this track is up-beat, and has a hard 80’s electronic beat to it. Gary returns for the last time, for some soulful sax, whilst Tina sings lyrics that feel not a million miles away from her Private Dancer hit. This track was the fourth single, although whilst it wasn’t released in the UK, it was released in some European countries – including Poland where it reached #7. 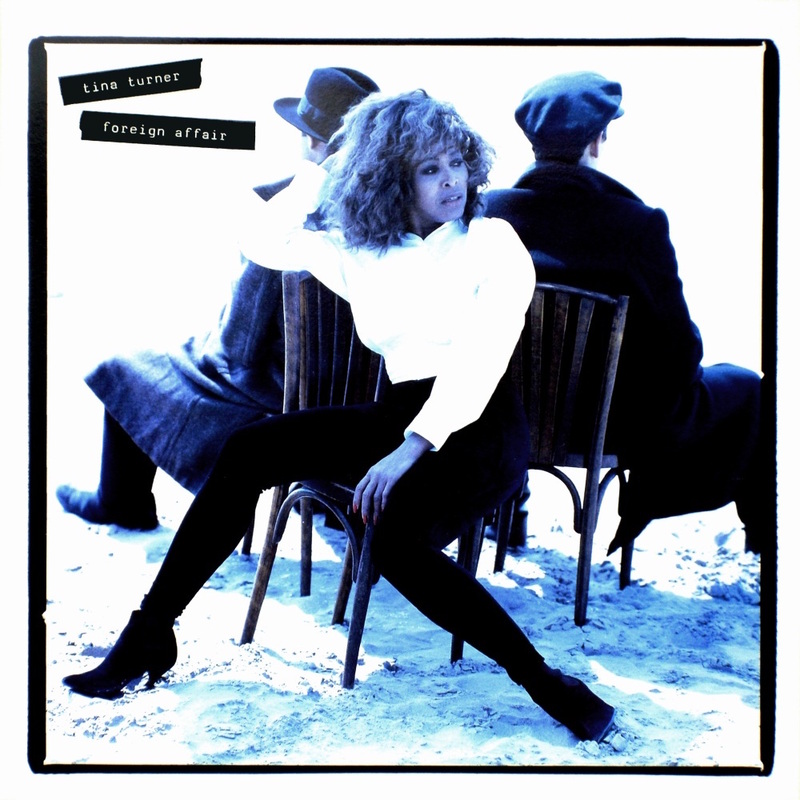 Over all, this album is a great piece of late-80s pop rock, and also great piece of Tina Turner’s work. There’s a couple of weaker tracks here (Ask Me How I Feel, and Look Me In The Heart), but nothing that isn’t well compensated in the rest of the tracks by the musician brilliance and Tina’s strong, confident, fiery vocals. Tina found great success with this album, which earned her another tour. Since the release of this album, she has consistently achieved success with her albums, and varying success with her singles. It was promptly followed by her solo career retrospective Simply The Best in 1990 which reached #2 and spent 180 weeks on the UK album chart. In 1993, Tina’s career was the subject to film What’s Love Got To Do With It featuring Angela Bassett as Tina, and Laurence Fishburne as her husband Ike Turner. The film was based on Tina’s book, and also features Tina in archive footage. The film was a hit, and continued the re-newed admiration of Tina’s work, with the soundtrack giving her her second #1 UK hit album. She followed this with hit albums including Wildest Dreams (1996) and Twenty Four Seven (1999). She also recorded the theme song to the James Bond series re-boot, GoldenEye (1995) film, which gave her her last top 10 UK hit. She announced semi-retirement in 2001, but returned to touring in 2008. Her most recent charting single in the UK was 2010’s version of Proud Mary which charted at #62 in the UK. She officially became a Swiss citizen in 2013, giving up her American citizenship. 1989 UK CHART PEAK: #1, certified 5x Platinum. Posted in 1980s, Tina TurnerTagged 1989, album, Be Tender With Me Baby, Dan Hartman, Foreign Affair, Gary Barnacle, I Don't Wanna Lose You, Look Me In The Heart, Mark Knopfler, review, Steamy Windows, The BestBookmark the permalink.